174 pages | 5 B/W Illus. Museums Involving Communities: Authentic Connections explores how museums can become more active and also considers how they might involve members of their local communities in their everyday work. 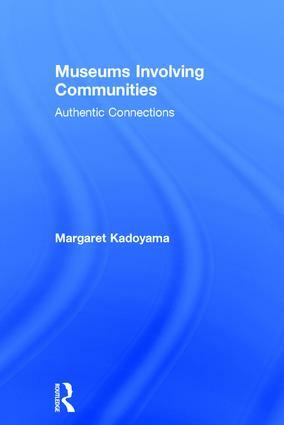 Examining the key components of the museum–community relationship, this booklooks at both the impact of museums on the cultural and civic lives of local communities and the impact of local communities on the programs, collections, and organizational culture of museums. Advocating an accessible and inclusive approach to museum management, Kadoyama focuses on the role of museum leadership in fostering and deepening community relationships. The result offers insights into how relationships between communities and museums can be forged in practice, how museums can be involved in building healthier communities, and how community engagement strategies can be developed, implemented, and evaluated successfully. Written by an experienced museum professional with extensive experience in community involvement and audience development, Museums Involving Communities is key reading for museum workers looking to make an impact, while building long-term relations with local communities, to the benefit of both museum and community. It should also be of great interest to students taking courses in museum and heritage studies. "Museums Involving Communities:Authentic Connections offers plenty of worksheets, tips, and advice for the novice and the expert alike. It digs deep to unpack the role of museums in the cultural and civic life of local communities and as agents of community change. The deepening of relationships by museum workers looking to make an impact, while building long-term partnerships with local communities, can profoundly benefit the individuals involved, the museum and its bottom line, and the community. The extent to which this book can assist museums in developing engagement strategies for implementation and evaluation will cement its true value to the profession. It’s not only a tall order, but a collective call to action that positions institutions to shape a better tomorrow for those they serve." Margaret Kadoyama has over thirty-five years of experience in the museum profession. She is a faculty member at John F. Kennedy University, USA, and principal of Margaret Kadoyama Consulting, a consultancy specializing in community engagement and audience development.